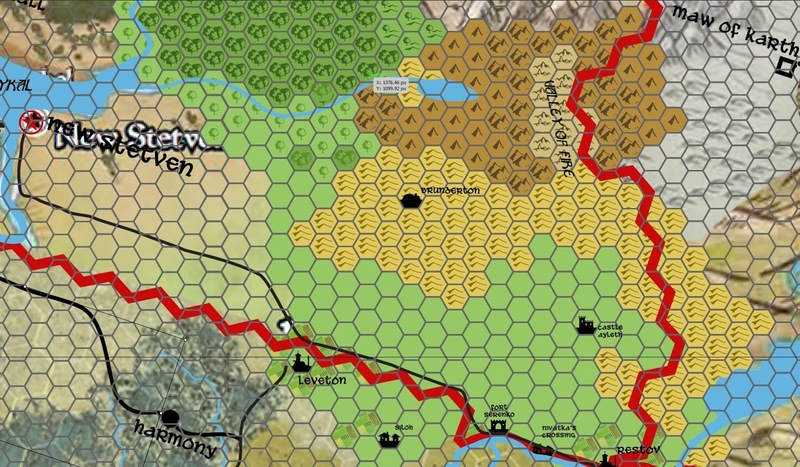 Our Kingmaker campaign is quickly drawing to a close and I've volunteered to start the next AP. I picked Giantslayer, but with a caveat. The party didn't really want to leave the country and story we've been working on for the past 3+ years. So I decided to move Giantslayer from Belkzen to Brevoy. It'll be 25 years after the start of Kingslayer and there'll be all sorts of changes to Brevoy and the PC Kingdom. Because the PCs will be going back and forth between their kingdom and Brevoy and because I need to place encounters and be able to figure out where things are - I'm putting together a 6 mi per hex map of the area. The starting town in Brunderton. It requires a bunch of rewrites, but less than you think. Southeastern Brevoy at 6 miles per hex. Among the interesting features is having the Valley of Fire as "broken lands" as well as having the dark trees as "old growth" forest. Any possibility of getting your layer map for the River Kingdoms + Brevoy + Iobaria? Apologies for the extreme delay. I've been ill and real-world stuff has had to take precedence. The layer map is quite huge - it's 200+MB in size. My desktop can barely run it and it's got 32GB of RAM. So, I'm not opposed to sending you a copy, I just don't know exactly how to get it to you.